Everywhere I look on the web I find articles about how businesses need to be on social media. They explain how if you aren’t on social media you are missing out on engaging with many of your current and future customers. They tell you how many millions of people are on social media daily, minute by minute and how they are making decisions on purchases influenced by what they see and read. All of this leads businesses into the rush to get into the social media blitz and reap the big rewards. Unfortunately many of them do not do the groundwork first but rather just crank up a Facebook page, a Twitter page, a YouTube channel, a LinkedIn page, a Google+ page and the list goes on and on until they have gotten themselves on every possible platform. With all these channels being basically free to set up it is easy to go too far. Now come the really hard part! Social Media is Not Free! No matter what you may have been told or read, social media is not free! The basic platform may be free from Google or Facebook or wherever, but you have to put the time into administering them on a daily basis. We all know that in business, time is money, so how much time (read money!) are you willing to put into your social media presence? The more platforms you set up, the more time you must devote to updating, posting, commenting, replying, tweeting, monitoring, etc. All of this means more time and again, more money. Unless a business has a full time social media manager, this task is normally handled by someone with another full time job. This means less attention to social media than their primary duty, less time to devote to social media and less engagement. In the end you could be investing more money and getting less in return for it. 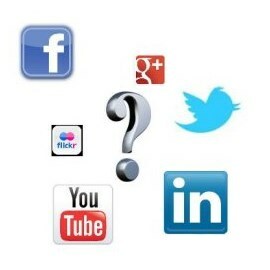 Where Do You Place Your Social Media Efforts? For small to medium sized businesses it is important to do the research to determine which platforms your real customers are located on. Next you should limit your initial entry into social media to no more than 3-4 platforms. I would recommend Facebook, Twitter with addition of LinkedIn or Google+ and YouTube depending on your specific business. It is important for businesses to assign someone as the overall manager for its social media presence. This will ensure a consistency of presence on all platforms. Setting up a posting, monitoring and response schedule are important tasks and overall management should be by a single person to maintain consistency. The establishment of a social media policy should also be a priority and can help to eliminate those embarrassing mistakes that we hear about occasionally from businesses. Social media can be a big addition to the marketing effort for any business. Be careful in not starting out by spreading your efforts over too many platforms and focus on a narrow area where your customers are located.